Civic Projects Director Kati Rubinyi will be moderating a panel discussion about the new book: The Car in 2035: Mobility Planning for the Near Future – An artful and refreshingly multifaceted view of the future of mobility, focusing on the car, the street, and public policy in Southern California. In this collection of essays and images, the car is viewed as both a challenge and benefit to our neighborhoods, cities, and suburbs. Despite rising fuel prices, the automobile will be Southern California’s primary form of transportation in 2035 because the region’s population will be continue to be dispersed widely, and the car offers the best access to the area’s tremendous diversity of economic, social, recreational, and cultural opportunities. But our infrastructure will need to accommodate a heterogeneous mix of modes of transportation… including more cars on the road than today. 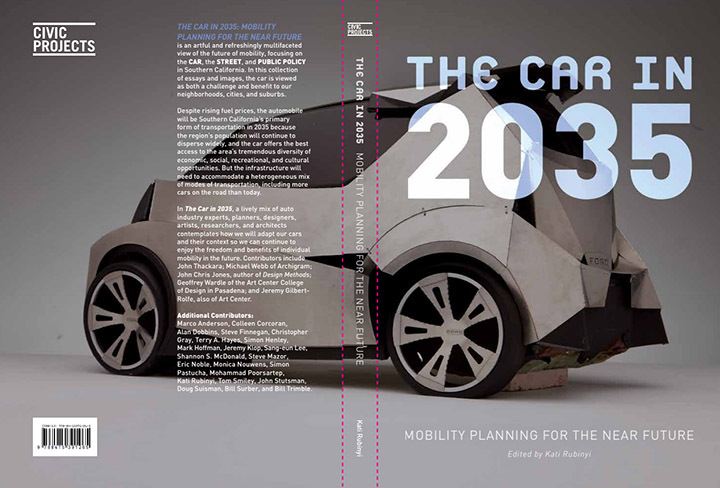 In The Car in 2035, a lively mix of authors contemplates how we will adapt our cars and their context so we can continue to enjoy the freedom and benefits of individual mobility in the future. Contributors include John Thackara; Michael Webb of Archigram; John Chris Jones, author of Design Methods; and Jeremy Gilbert-Rolfe of the Art Center College of Design, and Geoff Wardle, Director of Advanced Mobility Research at Art Center.